Summer means school is out! It means family vacations, water parks, beaches, and 4th of July. Most importantly, it means heat! Sunscreen becomes part of our daily routine as we attempt to protect ourselves from the season’s brutal rays. If the sun is too hot for us, then we can assume it is too hot for your garden as well. Plants need the sun in order to grow to their full potential, but overexposure can be as harmful as no sun at all. Fortunately, there are a few summer gardening tips that will help you grow a successful garden even during the hottest summer! Summer Sun and warmth opens up your options for gardening, but too much can be harmful. Useful facts guaranteed to make you the life of the party. The general belief among people in regards to seasonal temperature variations is that summers are hot because we are closest to the sun, and winters are cold because we are furthest from the Sun. While this is sound logic, we are actually furthest from the sun in the summers and closest in the winters! Seasonal temperatures are not controlled by our proximity to the sun, but rather the tilt of the Earth’s axis. During the summer, the sun’s rays hit the earth’s surface at a steep angle which intensifies the amount of energy in one area instead of allowing it to disseminate. The angle of the rays coupled with the longer days allow for higher average temperatures to be reached during the summer months. During the winter, the opposite occurs. The sun’s rays hit the surface at a shallow angle that spreads energy out and decreases its intensity. The winter season also has shorter days and, consequently, less time spent in the sun. According to The Old Farmer’s Almanac (known to be 80% accurate), temperatures during the summer average between 70⁰ and 80⁰ Fahrenheit nationwide. In states such as Florida, high temperatures can average in the lower 90⁰’s F. Temperatures in this range can cause heat exhaustion and even heat stroke to some of us. High summer temps rule out some plant options in your garden. Choose plants that can take the heat! A list of heat tolerant plants to inspire your ‘green thumb’. If people have a sensitivity to the summer’s relentless heat, then you can bet plants do as well. When growing a summer garden, the first thing to do is find some hearty summer plants! There are temperature ranges that are optimum for certain plants to grow in, which is why it’s important to make smart seasonal selections. Cool season crops germinate at 40⁰-80⁰ F, and warm season crops germinate at 50⁰-90⁰ F. Since summers have been getting warmer (the NOAA, NASA, and Japan Meteorological Agency date indicated that the 2015 summer temperatures were record breaking), choosing suitable plants has never been more critical. 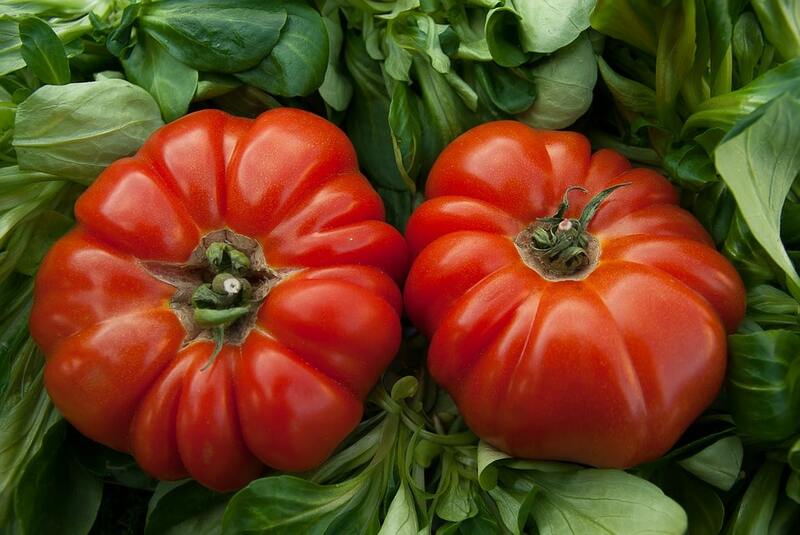 Some of the the toughest summer vegetables are tomatoes and hot peppers. They not only withstand the heat, they thrive in it! “Solar Fire is our best bet yet for a tomato that can set fruit at warm temperatures,” says Jay Scott, a professor of horticultural sciences at UF’s Gulf Coast Research and Education Center in Bradenton. When daytime temperatures are higher than 85⁰ F and nights above 72⁰ F, the plants may look dark green and healthy, but have blossoms that dry up and fall off. You can boost your success rate by planting more towards the center of your garden where the soil temperatures are lower from the shade of surrounding plants. A huge variety of heirloom tomatoes thrive in the heat. Add them to your summer garden plans. Picking proper seasonal plants may be key to your summer garden but that won’t be enough to stave off damaging heatwaves. Vegetables and flowers should be protected from exposure to temperatures greater than 95⁰ F. Don’t have a thermometer? 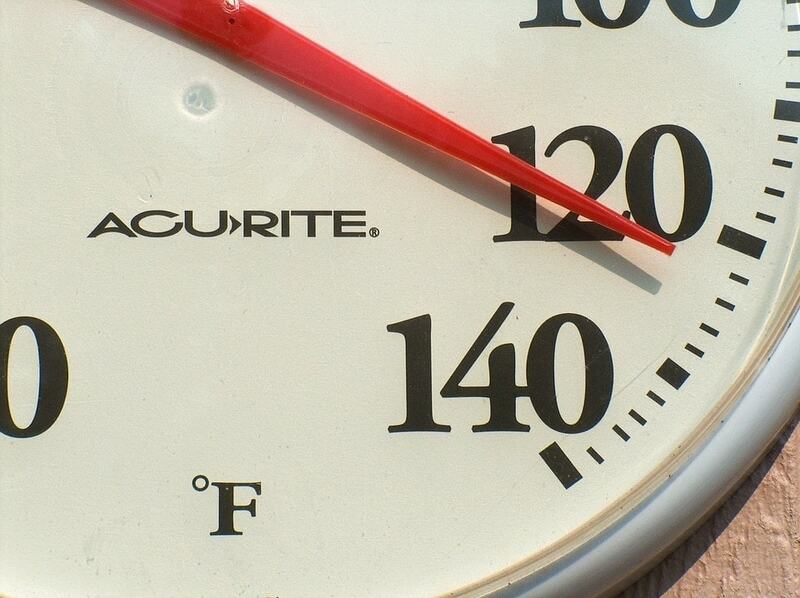 If not, you can look for signs of heat stress in your garden to determine if further protection is needed. Symptoms of heat stress include: wilting, blossom and leaf loss, and dull yellow patches on leaves and produce. Heat stress can irrevocably damage your garden, so take care to protect against it. Preventative care can be accomplished with a few simple tips! Keep soil evenly moist. Moist soil will protect roots from the heat and provide plants with much needed moisture. The best method is to use irrigation hoses that feed a gentle flow of water directly to the soil surface evenly and continuously. Soil moisture should reach up to 4 inches in depth to provide the best protection for gardens. This is one of the many reasons Garden in Minutes Garden Grid is so effective in a square foot garden; it’s not only simple, it’s defensive! Mulch. Covering your garden with a thick mulch dually protects from the sun AND helps the soil retain moisture and nutrients. Mulch can also be used during the winter months when you want to protect against frost and the harsh cold. It is considered an insulator, retaining heat when it is cold, and staying cool when it’s hot. Bagged mulch can be found at your nearest garden center, or it can be handmade right at home. If you want to know more, read about mulch here. Weed your garden. Removing weeds reduces competition for the limited moisture and nutrients in soil. High temperatures quickly dry out soil, leaving it hard and stale. Soil is the “primordial soup” from which plants grow; without it, there is no life! Let your flowers and vegetables take advantage of all they can get by reducing the competition caused by weeds and unwanted vegetation. Shade against direct sunlight. 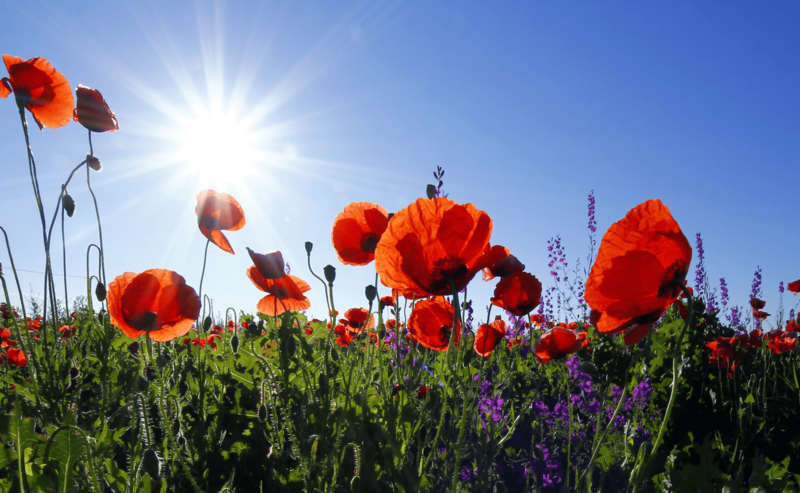 Direct sunlight is harmful to your plants and soil. Luckily, there is a simple solution. Shade! Shade covers should be lightweight and light colors that reflect light instead of absorb it. Covers can be cloth, such as old sheets, or mesh like an old window screen. There is also a wide variety of gardening shade at your local garden center. Your protective shade should be 3 to 4 feet away from the plants for optimum airflow. Using flexible PVC, you can create a flexible structure to hold your shade in place that can later be removed when the temperature cools down. It is important to protect plants located on the south and west ends of the garden from direct sunlight occurring near sunset. This can be accomplished with a shade shield. Simply hang a cloth from a line stretched between 2 posts (these can be temporary or permanent. It doesn’t have to look pretty, it just needs to work). A shade shield could be all your garden needs to beat the sun’s concentrated summer heat! Keep up to date on your local weather. This one is easy. Keep tabs on the weather in your area at least weekly. Knowing when there may be a heat wave will give you time to protect your garden, and may end up saving all your hard work! Staying informed is the best way to protect and nourish a garden, whether you are a green horn or a green thumb. Every season comes with a challenge, and summer doesn’t hold back. We need to take care of not only ourselves, but of our gardens as well. Don’t let the heat beat down your vision of a productive garden, use these summer growing tips to grow the best summer crop you can. At Garden In Minutes, we want you to get the most out of your gardening experience – bragging rights included when friends and neighbors see your beautiful plants!